Why Don’t Americans Know What Really Happened in Vietnam? Instead of confronting the truth, we scrubbed the record clean—and we’re still paying for it in Afghanistan and Iraq today. This article originally appeared at TomDispatch.com. To stay on top of important articles like these, sign up to receive the latest updates from TomDispatch.com. The 1960s—that extraordinary decade—is celebrating its 50th birthday one year at a time. Happy birthday, 1965! 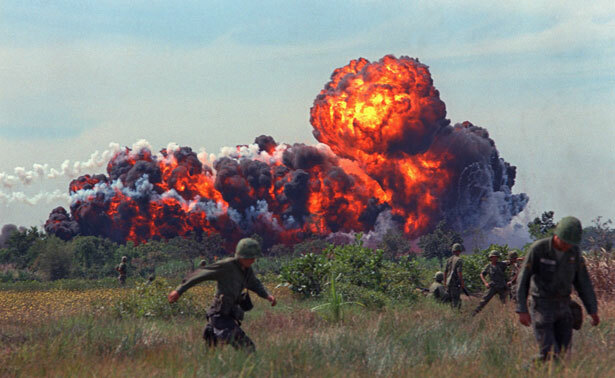 How, though, do you commemorate the Vietnam War, the era’s signature catastrophe? After all, our government prosecuted its brutal and indiscriminate war under false pretexts, long after most citizens objected, and failed to achieve any of its stated objectives. More than 58,000 Americans were killed along with more than 4 million Vietnamese, Laotians, and Cambodians. For a little perspective on the 50th anniversary, consider this: we’re now as distant from the 1960s as the young Bob Dylan was from Teddy Roosevelt. For today’s typical college students, the Age of Aquarius is ancient history. Most of their parents weren’t even alive in 1965 when President Lyndon Johnson launched a massive escalation of the Vietnam War, initiating the daily bombing of the entire country, North and South, and an enormous buildup of more than half a million troops. In the post-Vietnam decades, our culture has buried so much of the history once considered essential to any debate about that most controversial of all American wars that little of substance remains. Still, oddly enough, most of the 180 students who take my Vietnam War class each year arrive deeply curious. They seem to sense that the subject is like a dark family secret that might finally be exposed. All that most of them know is that the Sixties, the war years, were a “time of turmoil.” As for Vietnam, they have few cultural markers or landmarks, which shouldn’t be surprising. Even Hollywood—that powerful shaper of historical memory—stopped making Vietnam movies long ago. Some of my students have stumbled across old films likeApocalypse Now and Platoon, but it’s rare for even one of them to have seen either of the most searing documentaries made during that war, In the Year of the Pig and Hearts and Minds. Such relics of profound antiwar fervor simply disappeared from popular memory along with the antiwar movement itself. On the other hand, there is an advantage to the fact that students make it to that first class without strong convictions about the war. It means they can be surprised, even shocked, when they learn about the war’s wrenching realities and that’s when real education can begin. For example, many students are stunned to discover that the US government, forever proclaiming its desire to spread democracy, actually blocked Vietnam’s internationally sanctioned reunification election in 1956 because of the near certainty that Vietnamese Communist leader Ho Chi Minh would be the overwhelming winner. They’re even more astonished to discover the kind of “free-fire zone” bloodshed and mayhem the U.S. military unleashed on the South Vietnamese countryside. Nothing shocks them more, though, than the details of the My Lai massacre, in which American ground troops killed, at close range, more than 500 unarmed, unresisting, South Vietnamese civilians—most of them women, children, and old men—over a four-hour stretch on March 16, 1968. In high school, many students tell me, My Lai is not discussed. At that moment, forgetting made all the sense in the world since it seemed unimaginable, even to the president, that Americans would ever find a positive way to remember the war—and little wonder. Except for a few unapologetic former policymakers like Walt Rostow and Henry Kissinger, virtually everyone, whatever their politics, believed that it had been an unmitigated disaster. In 1971, for example, a remarkable 58% of the public told pollsters that they thought the conflict was “immoral,” a word that most Americans had never applied to their country’s wars. How quickly times change. Jump ahead a decade and Americans had already found an appealing formula for commemorating the war. It turned out to be surprisingly simple: focus on us, not them, and agree that the war was primarily an American tragedy. Stop worrying about the damage Americans had inflicted on Vietnam and focus on what we had done to ourselves. Soon enough, President Ronald Reagan and his followers were claiming that the war had been disastrous mainly because it had weakened an American sense of pride and patriotism, while inhibiting the nation’s desire to project power globally. Under Reagan, “Vietnam” became a rallying cry for both a revived nationalism and militarism. Though liberals and moderates didn’t buy Reagan’s view that Vietnam had been a “noble” and winnable war, they did generally support a growing belief that would, in the end, successfully supplant lingering antiwar perspectives and focus instead on a process of national “healing.” At the heart of that new creed was the idea that our own veterans were the greatest victims of the war and that their wounds were largely a consequence of their shabby treatment by antiwar protesters upon returning from the battle zone to an unwelcoming home front. Indeed, it became an article of faith that the most shameful aspect of the Vietnam War was the nation’s failure to embrace and honor its returning soldiers. Of course, there was a truth to the vet-as-victim belief. Vietnam veterans had, in fact, been horribly ill-treated. Their chief abuser, however, was their own government, which first lied to them about the causes and nature of the war, then sent them off to fight for an unpopular, dictatorial regime in a land where they were widely regarded as foreign invaders. Finally, on their return, it failed to provide them with either adequate support or benefits. And corporate America was also to blame. Employers were reluctant to hire or train them, in many cases scared off by crude 1970s media stereotypes about wacko, drug-addled, and violent vets. Nor did traditional veterans’ organizations like the American Legion or the Veterans of Foreign Wars provide a warm welcome to those coming home from a deeply contested and unpopular war filled with disillusioned soldiers. In the 1980s, however, the Americans most saddled with blame for abusing Vietnam veterans were the antiwar activists of the previous era. Forget that, in its later years, the antiwar movement was often led by and filled with antiwar vets. According to a pervasive postwar myth, veterans returning home from Vietnam were commonly accused of being “baby killers” and spat upon by protesters. The spat-upon story—wildly exaggerated, if not entirely invented—helped reinforce the rightward turn in American politics in the post-Vietnam era. It was a way of teaching Americans to “honor” victimized veterans, while dishonoring the millions of Americans who had fervently worked to bring them safely home from war. In this way, the most extraordinary antiwar movement in memory was discredited and dispatched to the trash bin of history. In the process, something new happened. Americans began to treat those who served the country as heroic by definition, no matter what they had actually done. This phenomenon first appeared in another context entirely. In early 1981, when American diplomats and other personnel were finally released from 444 days of captivity in Iran, the former hostages were given a hero’s welcome for the ages. There was a White House party, ticker-tape parades, the bestowal of season tickets to professional sporting events, you name it. This proved to be where a new definition of “heroism” first took root. Americans had once believed that true heroes took great risks on behalf of noble ideals. Now, they conferred such status on an entire group of people who had simply survived a horrible ordeal. To do so next with Vietnam veterans, and indeed with every soldier or veteran who followed in their footsteps, seemed like a no-brainer. It was such an easy formula to apply in a new, far more cynical age. You no longer had to believe that the missions American “heroes” fought were noble and just; you could simply agree that anyone who “served America” in whatever capacity automatically deserved acclaim. Since the attacks of 9/11, ritualized support for troops and veterans, more symbolic than substantive, has grown ever more common, replete withyellow ribbons, airport greetings, welcome home ceremonies, memorial highways, honor flights, benefit concerts, and ballgame flyovers. Through it all, politicians, celebrities, and athletes constantly remind us that we’ve never done enough to demonstrate our support. Although a majority of Americans came to reject the wars in both Afghanistan and Iraq in proportions roughly as high as in the Vietnam era, the present knee-jerk association between military service and “our freedom” inhibits thinking about Washington’s highly militarized policies in the world. And in 2012, with congressional approval and funding, the Pentagon began institutionalizing that Vietnam “thank you” as a multi-year, multi-million-dollar “50th Anniversary Commemoration of the Vietnam War.” It’s a thank-you celebration that is slated to last 13 years until 2025, although the emphasis is on the period from Memorial Day 2015 to Veterans Day 2017. Since the Pentagon realizes that, however hard you try, you can’t entirely “separate the warrior from the war,” it is also seeking “to provide the American public with historically accurate materials and interactive experiences that will help Americans better understand and appreciate the service of our Vietnam veterans and the history of US involvement in the Vietnam War.” However, it turns out that “accuracy” and “appreciation” can both be served only if you carefully scrub that history clean of untoward incidents and exclude all the under-appreciators, including the thousands of American soldiers who became so disgusted with the war that they turned on their officers, avoided or refused combat missions, deserted in record numbers, and created the most vibrant antiwar GI and veterans movement in our history. The most ambitious of the “educational resources” provided on the Vietnam War Commemoration website is an “interactive timeline.” As other historians have demonstrated, this historical cavalcade has proven to be a masterwork of disproportion, distortion, and omission. For example, it offers just three short sentences on the “killings” at My Lai (the word “massacre” does not appear) and says that the officer who led Charlie Company into the village, Lt. William Calley, was “sentenced to life in prison” without adding that he was paroled by President Richard Nixon after just three-and-a-half years under house arrest. That desperately inadequate description avoids the most obviously embarrassing question: How could such a thing happen? It is conveniently dropped onto a page that includes lengthy official citations of seven American servicemen who received Medals of Honor. The fact that antiwar Senator Robert Kennedy entered the presidential race on the same day as the My Lai massacre isn’t even mentioned, nor his assassination three months later, nor the assassination of Martin Luther King Jr., just weeks after My Lai, an event that spurred bitter and bloody racial clashes on US military bases throughout South Vietnam and the world. It should not go unnoticed that the same government that is spending $65 million commemorating the veterans of a once-reviled war has failed to provide sufficient medical care for them. In 2014, news surfaced that the Veterans Administration had left some 100,000 veterans waiting for medical attention and that some VA hospitals sought to cover up their egregious delays. Every day an estimated 22 veterans commit suicide, and among vets of Iraq and Afghanistan the suicide rate, according to one study, is 50% higher than that of their civilian peers. The Pentagon’s anniversary commemoration has triggered some heated push-back from groups like Veterans for Peace and the Vietnam Peace Commemoration Committee (co-founded by Tom Hayden). Both are planning alternative commemorations designed to include antiwar perspectives once so common but now glaringly absent from popular memory. From such efforts might come the first full public critical reappraisal of the war to challenge four decades of cosmetic makeover. Unfortunately, in our twenty-first-century American world of permanent war, rehashing Vietnam may strike many as irrelevant or redundant. If so, it’s likely that neither the Pentagon’s commemoration nor the antiwar counter-commemorations will get much notice. Perhaps the most damaging legacy of the post-Vietnam era lies in the way Americans have learned to live in a perpetual “wartime” without war being part of daily consciousness. While public support for Washington’s war policies is feeble at best, few share the Vietnam era faith that they can challenge a war-making machine that seems to have a life of its own. Last year, US Special Operations forces conducted secret military missions in 133 countries and are on pace to beat that mark in 2015, yet these far-flung commitments go largely unnoticed by the major media and most citizens. We rely on 1% of Americans “to protect our freedoms” in roughly 70% of the world’s countries and at home, and all that is asked of us is that we offer an occasional “thank you for your service” to people we don’t know and whose wars we need not spend precious time thinking about. From the Vietnam War, the Pentagon and its apologists learned fundamental lessons about how to burnish, bend, and bury the truth. The results have been devastating. The fashioning of a bogus American tragedy from a real Vietnamese one has paved the way for so many more such tragedies, from Afghanistan to Iraq, Pakistan to Yemen, and—if history is any guide—an unknown one still emerging, no doubt from another of those 133 countries. Christian AppyChristian Appy is the author of American Reckoning: The Vietnam War and Our National Identity (Viking).